BE CAREFUL TO AVOID UNDERGROUND UTILITIES. BEFORE DIGGING, CONTACT YOUR LOCAL UNDERGROUND DAMAGE PREVENTION SYSTEM. 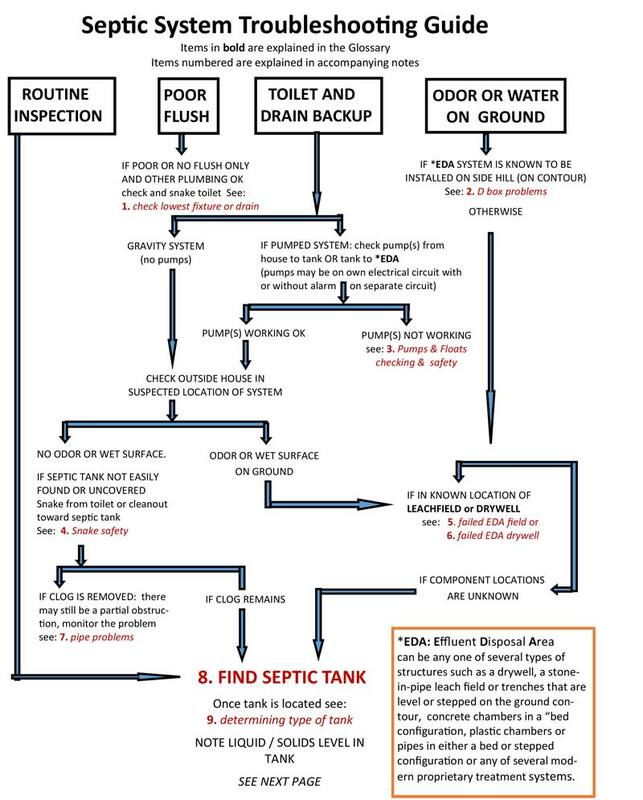 Check Lowest Fixture or Drain: If problem is septic blockage, water should back up through any drain which is below level of toilet when flushed. Check washing machine outlet, floor drain, bathtub, downstairs apartment, or remove cleanout plug carefully (to avoid a flood). If no backup, problem likely with toilet or other household plumbing only. D-Box Problems: If distribution box for side hill trench system is out of level, one trench may be taking all water and "failing." Re-level pipes and block outlet to overloaded trench for several months. Or, roots could be blocking one or more pipes. Remove roots and seal joints where roots entered if possible. Note that an unlevel D box will not affect leach bed as severely, because water will find its own level through stone. Pumps and Floats: Exercise care handling pumps as they have 110- or 220-volt supply lines, which may not have GFCIs (Ground Fault Circuit Interrupters). Some float systems (which turn pump and alarm on and off) may also contain full line voltage. Use insulating rubber gloves and follow procedures with a disinfecting hand wash for sanitation. Or call licensed plumber, if required by code. Note that GFCI protected submersible pumps will often trip the GFCI long before they fail. This is due to a minute current leaking out of the pump and is not generally harmful. It is recommended by experienced plumbers to NOT use a GFCI protected circuit for submersible septic pumps. Snake Safety: Exercise care using snake in cleanouts or drains as some waterborne diseases can be transferred through contact. Use rubber gloves and surgical masks and follow with disinfecting wash. Stiff garden hose can sometimes be used in place of snake. Disinfect after use. 5. Failed EDA Field: Usually means soil plugged due to age, overuse, underdesign, lack of maintenance, or a combination of these. Requires field replacement or rest. See: Glossary: Alternating Fields. 6. Failed EDA Drywells: Usually means soil plugged due to age, overuse, under design, lack of maintenance, or a combination of these. Requires field replacement or rest. Drywells can sometimes be excavated around and repacked with crushed stone to create a new soil surface for absorption. Check codes. Pipe Problems: Settling, breaking, crushing, pulling apart and backslope are installation related. Freezing, plugging at joints, corrosion or decomposition and root plugging (though also caused by poor installation) can occur later. Insulating, replacing, releveling, sealing joints, and properly backfilling will resolve most problems. Find Septic Tank: If no one knows the exact location of septic system components or has an accurate plan to follow, start looking for septic tank outside of house where waste pipe exits basement wall. (Note pipe direction through wall.) When plumbing exits below slab, check side of house with roof vent, especially if most of plumbing is on that side of house. Look for spot on the ground where snow melts first, grass turns brown or there is slight depression or mound. Steel tanks will sometimes bounce slightly when jumped on, but be careful, steel lids rust out and people have fallen in! If the snake hits an obstruction but cannot be felt at the surface, remove it from the cleanout and measure its penetration into the pipe. Draw an arc on the ground at the distance of snake penetration from the house and try again with the probe along this arc. Remember that the pipe from the house may not be heading straight towards the tank or may have an elbow in it. If all else fails, locate and uncover the waste pipe where it leaves the house and again every few feet until the tank is located. Or ask previous owner, neighbor, or septic pumper who may have serviced the system in the past. Note: Devices are available that transmit a radio signal along a snake or from a thin "mole" that can either be flushed or taped to the end of a snake. This signal is traced by a receiver wand as the snake is pushed through the waste pipe often resulting in uncanny accuracy unless the pipe is cast iron that shields the radio signal. Determining The Type Of Tank Found:Primary / secondary septic tank. Two or more tanks are used in some installations for better settling and detention of solids. First tank should have fresh waste entering directly from the house. (Flush colored paper towel or similar recognizable item down the toilet and watch it enter at inlet check point.) Second tank should have a little floating grease and scum, with some settled sludge at the bottom, Note that a septic tank always has an outlet unless it is being used as a holding tank. Cesspool or drywell. Likely has no outlet and seldom has an inlet baffle. Liquid level could be low in a septic tank if it is rusted out (steel tank) or if center seam leaks (concrete tank). If fresh waste is present, see glossary: cesspool. If no fresh waste is present, see glossary: drywell. One of a series of cesspools. Grease trap. Found in restaurants, inns, markets, etc. Pump tank (or pump chamber). Used if system is not gravity fed. Note: Once you locate the septic tank, you may wish to have it pumped out. If water runs back into septic tank from the outlet pipe when the tank is pumped out, system has probably failed. See: 5. Failed EDA Field or 6. Failed EDA Drywell. Inlet/Outlet Problems: Plugging often occurs from scum buildup within baffles, roots entering through poorly sealed joints, tanks installed out-of-level or backwards, or pipes sticking into the tank too far and nearly hitting baffles, blocking waste. Correct as needed. Locating Field or Drywell: Follow directions to 8. 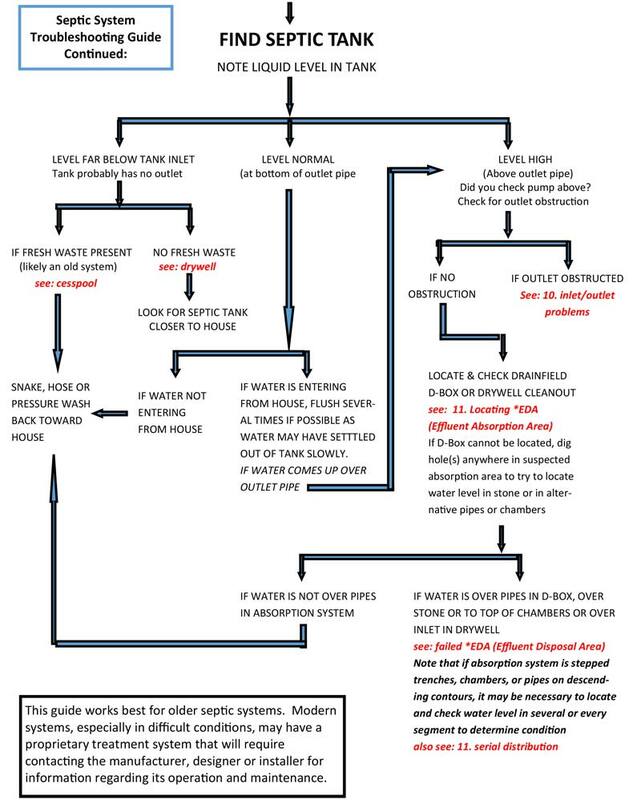 Find Septic Tank except start at the septic tank outlet rather than at the house. Snake will not hit a baffle within a drywell as there is none. It may or may not hit the side of a Distribution Box but could possibly pass through into one of the outlet pipes if that pipe is in line with inlet. Serial distribution systems using one of the newer plastic chamber or pipe systems (such as EnviroSeptic ) usually do not have a distribution box so a snake will pass through from the connecting pipe into the distribution/absorption pipe. The original type of sewerage system, often still in use inolder homes. They were simply a single hole in the ground loosely blocked up with locally available materials - stone, brick, block, or railroad ties - and capped either with ties covered with a layer of old steel roofing or a cast-in-place concrete lid with a cleanout hole near the center. All household wastewater entered and the liquid portion was absorbed into the ground. When the soil plugged, a new cesspool was added. Wiser installers placed an elbow, or better still, a tee in the outlet pipe from the first cesspool, creating a baffle to hold back the floating greases and scums. Constructed identically to a cesspool and differs only in that the clarified effluent from a septic tank or the wastewater from a washing machine or other grey water may enter. Modern drywells are often precast perforated rings surrounded by crushed stone to increase the absorption area. Drywells can also be used to return storm water to the ground or to relocate basement drainage water to another location above the water table. Russ Lanoie has been a private contractor in the White Mountains of New Hampshire for over 35 years. He specializes in soil and water issues related to buildings and property in an environment with considerable frost, snowfall, and torrential thunderstorms.